We provide a comprehensive compilation of 105 species of Aphidoidea adventive to the Hawaiian Islands based on literature records and a taxonomic analysis of available specimens. Seventeen species are recognized as new to the Islands. For each species information on synonyms, origins, distribution, and hosts is given. The average rate of introduction has been about 0.82 species per year. Approximately 35% of the species originate in East Asia, 35% from Europe and West Asia, and 21% from North America. Manduca blackburni, commonly known as Blackburn’s Sphinx Moth, is a federally listed endangered species restricted to localized habitats on three islands in the Hawaiian archipelago. Manduca blackburni was thought to be closely related to the widely distributed New World species M. quinquemaculatus, but this has never been formally tested, and shortly after its description, many authors dismissed it as a subspecies or form of M. quinquemaculatus. We used one mitochondrial gene, COI, and two nuclear genes, CAD and EF-1α (2,975 bp total), to examine the phylogenetic relationships between M. blackburni and putative sister species in the genus. The phylogeny resulting from two single-gene analyses (CAD, COI) and the concatenation of all three genes suggest that M. blackburni + M. quinquemaculatus are sister taxa, and the monophyly of each species is supported with relatively high branch support under parsimony, maximum likelihood, and Bayesian inference. Manduca blackburni and M. quinquemaculatus also differ in genetic distance for CAD and COI, and we therefore consider them separate species. Thus, our molecular results corroborate previous studies on the morphology of M. blackburni and retain the species rank of this taxon. Our results also indicate that one or more South American subspecies of M. sexta may merit elevation to species. Genetic connectivity was studied in two scleractinian corals, Pocillopora damicornis (branching and broadcast spawner) and Porites panamensis (massive and brooding type), along the Pacific coast of Mexico. Allelic diversity between adults and juveniles, the latter recruited after the El Niño–Southern Oscillation (ENSO) 1997–1998 event, was determined, and level of genetic connectivity among populations was assessed. There were no significant differences in allelic diversity between adults and juveniles from the same location. Seascape spatial genetic analysis suggested two or three clusters, depending on the species: (1) Bahías de Huatulco, (2) south of the Baja California Peninsula and Bahía de Banderas, and (3) locations in the Gulf of California. The most important barrier to gene flow was detected between Bahía de Banderas and Bahías de Huatulco and corresponds with a major coastal stretch of sandy beaches and lagoons. Moderate to high gene flow was found inside and at the entrance of the Gulf of California (Nem = 62–250), possibly favored by seasonal circulation patterns and sexual reproduction. In contrast, low gene flow was observed between southern populations and the rest of coastal Mexico (Nem < 1.7) based on high local recruitment and habitat discontinuity. A close genetic relationship of corals from the southern part of the Baja California Peninsula and severely damaged Bahía de Banderas coral communities confirmed that exchange of propagules could have taken place between the localities after the ENSO 1997–1998 event. Despite different reproductive strategies, both species showed similar patterns, suggesting the importance of surficial currents and habitat discontinuity to predict connectivity among coral reefs. Little is known about density and structure of black coral populations of the continental Pacific coasts of Central and South America. Species diversity and ecology of the antipatharian fauna of Machalilla National Park (Province of Manabí, Ecuador) were surveyed using scuba, and two species, Myriopathes panamensis and Antipathes galapagensis, were identified. New information on the two species and their associated fauna was obtained through both underwater observations and laboratory analyses. Specific associations with stalked barnacles and parasitic zoanthids are described. An underwater visual census indicated that the black coral assemblage had a maximal density between depths of 15 and 30 m. Myriopathes panamensis commonly occurred below 20 m depth, and A. galapagensis was mainly recorded from deeper than 25 m depth. Surveyed sites were characterized by sparse rocks mixed with sandy patches, and occurrence of black corals was mainly related to availability of rocky substrate. With an average density of 0.5 colonies m-2 , the shallow black coral community of Machalilla National Park is one of the densest in the world. Data from this study represent a clear baseline for monitoring of population dynamics of benthic organisms in an area subjected to periodic El Niño and La Niña events, which may greatly affect composition and abundance of the marine communities. Anchialine pools, which are defined as land-locked mixohaline pools with tidal influence, are unique and increasingly rare habitats in the Hawaiian Islands. Particularly, anchialine pools in Manukā on the island of Hawai‘i are home to a diverse, rare, and unique assemblage of decapod crustaceans. Diurnal and nocturnal surveys of motile aquatic species were conducted across 81 anchialine habitats in the Manukā watershed to perform diel comparisons of species assemblages, richness, abundances, distributions, and hydrography. Nocturnal surveys revealed significant increases in abundances, distributions, and species richness throughout Manukā’s anchialine habitats. 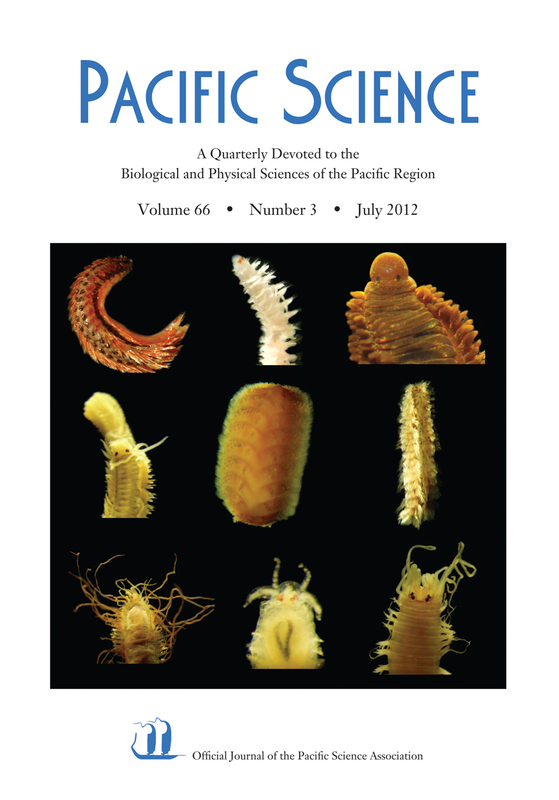 Of particular interest are six native anchialine decapods, Halocaridina rubra, Metabetaeus lohena, Calliasmata pholidota, Antecaridina lauensis, Procaris hawaiana, and Palaemonella burnsi, that exhibited notable diel patterns in abundance and distribution. In addition, a recent new record of a caridean shrimp and two unidentified species were documented. Factors influenced by diel period (i.e., behavior of introduced predators and sun exposure) and various hydrographic and habitat characteristics were suspected to affect patterns in the biological parameters that were measured. The addition of nocturnal surveys can provide valuable biological information to anchialine habitat resource management that would not have been obtained with diurnal surveys alone. Etrumeus makiawa is described as a new species of round herring from the Hawaiian Islands. Formerly identified as E. micropus (type locality, Japan), it is distinct from that species in having modally one fewer pectoral ray and 48–51 gill rakers, compared with 44–48 for E. micropus. Japanese and Hawaiian Etrumeus compose reciprocally monophyletic mtDNA lineages (d = 4.60%) with a long period of separation (ca. 2.3 million yr). This new Hawaiian endemic is also differentiated from E. acuminatus in California and Baja California, which instead has a count of 41–45 gill rakers, a larger maximum size (to 280 mm SL, compared with 198 mm for E. makiawa), and a clearly different mtDNA sequence (d = 2.20%). The northwestern Atlantic species, E. sadina (E. teres is a synonym), has 49–54 gill rakers and is genetically differentiated from all the other species considered here (d = 15.95% to 17.58%). Plant species, their parts, and derivatives have been transferred by humans since the beginning of history: unintentionally (e.g., with propagules adhering to clothes) or intentionally (e.g., when species or parts of them were used for food or as sources of tools). Numerous plant transfers resulted in species becoming permanently naturalized in new areas, in some cases with extremely negative effects for the region to which they were brought. However, transfers also often proved neutral or even beneficial. This article does not intend to give a comprehensive survey of the history and the consequences of plant transfers in space and time but presents and discusses illustrative examples of plant movements by people. Special emphasis is given to effects on islands and to historical, political, and economic aspects of long-distance plant trade in the Old World often little known by botanists. Most rust fungi are highly host specific, but Puccina psidii has an extremely broad host range within Myrtaceae and gained notoriety with a host jump in its native Brazil from common guava (Psidium guajava) to commercial Eucalyptus plantations. When detected in Hawai‘i in April 2005, the first invasion outside the neotropics/subtropics, there was immediate concern for ‘ōhi‘a (Metrosideros polymorpha). ‘Ōhi‘a composes 80% of native forest statewide, providing stable watersheds and habitat for most Hawaiian forest birds and plants. Within months, rust spores spread statewide on wind currents, but ‘ōhi‘a was found to be only a minor host, showing very light damage. The primary host was nonnative rose apple (Syzygium jambos), severely affected at a landscape scale, but the epiphytotic subsided as rose apple was largely defoliated or killed within several years. The limited and stable host range in Hawai‘i (versus elsewhere) led the local conservation community to explore possibilities for excluding new genetic strains of P. psidii. Although national/international phytosanitary standards require strong scientific justification for regulations involving an infraspecific taxonomic level, hopes were buoyed when genetic studies showed no apparent genetic variation/evolution in Hawai‘i’s rust strain. A sophisticated genetic study of P. psidii in its home range is near completion; genetic variation is substantial, and host species strongly influences rust population structure. To prevent introduction of new strains, the Hawai‘i Department of Agriculture is moving ahead with establishing stringent measures that restrict entry of Myrtaceae into Hawai‘i. Meanwhile, P. psidii poses a major threat to Myrtaceae biodiversity worldwide. Within a single site in the Kohala Forest Reserve, Hawai‘i, we examined composition and diversity of soil microbial communities under four introduced (Cryptomeria japonica, Casuarina equisetifolia, Araucaria columnaris, and Eucalyptus sp.) and one native (Metrosideros polymorpha) canopy tree species, as well as pasture. Terminal restriction fragment length polymorphism (T-RFLP) analysis of soil bacteria, fungi, and archaea indicated that soil under the native M. polymorpha had the highest richness and greatest number of unique terminal restriction fragments, whereas soil under Eucalyptus and in pasture sites had the lowest richness. The soil microbial community differed significantly between Eucalyptus and M. polymorpha but not between the other three introduced species and M. polymorpha. The Eucalyptus microbial community was more similar to that of an adjacent deforested pasture site than to those of other forested stands. Soil pH was the environmental variable that best correlated with the ariation in soil microbial community composition between tree species. Beta Diversity of Tree Species along Soil-P Gradients in Tropical Montane Rain Forests of Contrasting Species Pools: Does Biodiversity Matter in Stabilizing Forest Ecosystems? This study concerns relationships between gamma diversity and beta diversity (species turnover) along a resource gradient. Model sites are the Hawaiian Islands, where the regional floristic species pool of tropical rain forests is much impoverished compared with Borneo, where the regional species pool is two orders of magnitude greater than in Hawai‘i. I examined the relationship between changes in percentage floristic similarity (PS) and changes in the soil P pool among pairs of plots located in these two regions. PS sharply decreased with increasing difference of soil P pool in Borneo (Mount Kinabalu), whereas PS did not significantly change with increasing difference of soil P pool in Hawai‘i. I suggest that a greater number of tree species that have high P-use efficiencies occur in Borneo due to its high gamma diversity. Stronger competitive exclusion because of the high gamma diversity will lead to displacements by species of progressively greater P-use efficiencies along a soil P gradient. Consequently, niche divisions along the soil P gradient will be formed, causing a greater beta diversity in Borneo. By contrast, a single species, Metrosideros polymorpha, monodominates the entire soil P gradient in Hawai‘i, leading to nonexistence of beta diversity along the soil P gradient. There are important implications of beta diversity for ecosystem maintenance. I suggest that a greater beta diversity can maintain forest biomass and productivity against soil P decline by providing more P-use efficient species along the gradient. Intensive rain-fed agricultural systems represented the foundation of the agricultural economies of the island of Hawai‘i and parts of Maui in the centuries before European contact. These systems largely were abandoned in the nineteenth century, and our understanding of how they functioned as productive systems is sparse. We established three experimental gardens within the ahupua‘a (traditional Hawaiian land division) of Puanui, in the Leeward Kohala Field System, where we have measured climate and soil properties and planted several Polynesian crops. We obtained relatively large yields of ‘uala (sweet potato, Ipomoea batatas) (from 1 to 4 kg of tubers per m2) from spring and summer plantings in two wetter, higher-elevation gardens; growth was slow there in the winter. In a drier, lower-elevation garden, only winter plantings provided reasonable yields (0.6 kg per m2). We suggest that Hawaiian farmers cultivated a winter crop of ‘uala in the lower, warmer, drier portion of the field system and grew spring-summer crops in the upper, wetter portion of the system. Ahupua‘a-level management in rain-fed agricultural systems could thus have functioned to integrate environmental variability and sustain yields through the year. 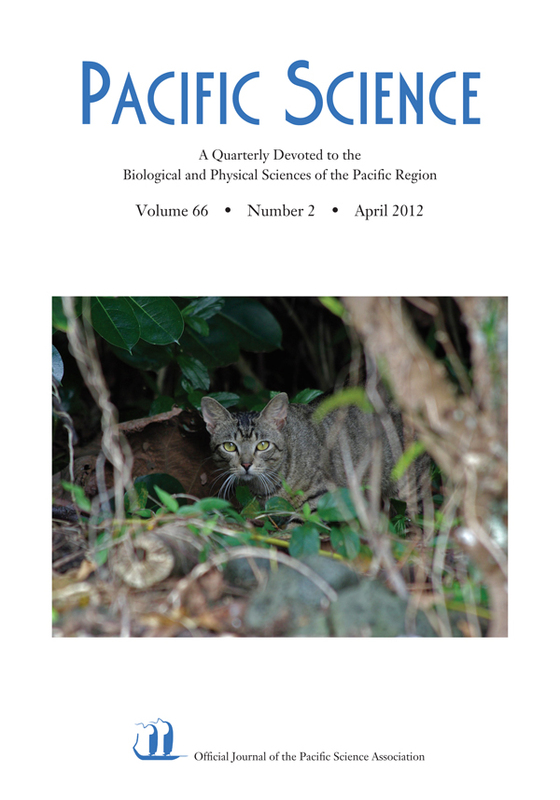 This article reviews the biology, ecological effects, and management of the domestic cat (Felis catus) in the Pacific basin. The cat is one of the most controversial invasive species in the Pacific region because of its complex relations with humans. At one extreme, well-fed domestic house pets are allowed outdoors where they may hunt native animals; at the other, unsocialized feral cats have replaced native predators as apex predators or occupy a new niche on oceanic islands, where they have devastated native faunas. In the middle are stray cats that are still socialized around humans. Feral and stray cats can be reservoirs of diseases that infect free-roaming domestic cats, humans, and wildlife. Given these problems, the best response would be to keep domestic cats indoors, restrict cat breeding, and remove feral populations. However, most Pacific basin societies have failed to reach a consensus on the cat problem, so solutions are ad hoc, often lacking in any scientific basis, and reflect our conflicting views. Compromise management might best fall into three broad classes: (1) eradication of cats should be confined to islands and other areas of high native biodiversity where reintroduction can be prevented; (2) in a landscape of low or moderate biological value, efforts should be made to educate the public to reduce the impact of their cats on remaining wildlife, while excluding cats from “islands” of elevated biodiversity values or human sensitivity; (3) in drastically simplified urban ecosystems, management perhaps should occur only in response to local complaints. A new species of diplodactylid gecko, Bavayia nubila Bauer, Sadlier, Jackman & Shea, n. sp., is described from forests at two sites in the drainage of the Tontouta Valley in the ultramafic ranges of southeastern New Caledonia. The new gecko is the sister species of the much smaller Bavayia goroensis; both species are basal within the B. cyclura clade. The area from which the species is recorded so far is the focus of extensive nickel mining operations, and because of its restricted distribution and the potential threats posed by mining in the region, it is here regarded as Endangered under IUCN red list criteria. The greenhouse frog, Eleutherodactylus planirostris, is a direct-developing (i.e., no aquatic stage) frog native to Cuba and the Bahamas.It was introduced to Hawai‘i via nursery plants in the early 1990s and then subsequently from Hawai‘i to Guam in 2003. The greenhouse frog is now widespread on five Hawaiian Islands and Guam. Infestations are often overlooked due to the frog’s quiet calls, small size, and cryptic behavior, and this likely contributes to its spread. Because the greenhouse frog is an insectivore, introductions may reduce invertebrates. In Hawai‘i, the greenhouse frog primarily consumes ants, mites, and springtails and obtains densities of up to 12,500 frogs ha-1. At this density, it is estimated that they can consume up to 129,000 invertebrates ha-1 night-1. They are a food source for the nonnative brown tree snake in Guam and may be a food source for other nonnative species. They may also compete with other insectivores for available prey. The greatest direct economic impacts of the invasions are to the nursery trade, which must treat infested shipments. Although various control methods have been developed to control frogs in Hawai‘i, and citric acid, in particular, is effective in reducing greenhouse frogs, the frog’s inconspicuous nature often prevents populations from being identified and managed. twentieth century, we show that land-bird extinction continued uninterrupted, mostly due to introduced predators and the continuous loss of wooded areas. Conversely, the list of breeding seabirds has remained relatively stable, but the number of breeding sites has decreased owing to introduction of predators, especially the cat and black rat. Today these sites are restricted to cliffs on the main islands and to remote islets. Bird habitat on the island of Tinian, Mariana Islands, has been substantially altered, and only around 5% of the island has native forest today. The modern bird fauna is likely to be a subset of the original avifauna where only species tolerant to native forest loss and human disturbance have survived. Avian surveys were conducted on the island in 2008 by the U.S. Fish and Wildlife Service to provide current densities and abundances of the remaining species, and assess population trends using data collected from previous surveys. During the three surveys (1982, 1996, and 2008), 18 species were detected, and abundances and trends were assessed for 11 species. Five of the nine native species and one alien bird have increased since 1982. Three native birds—Mariana Fruit-Dove (Ptilinopus roseicapilla), Micronesian Honeyeater (Myzomela rubratra), and Tinian Monarch (Monarcha takatsukasae)—have decreased since 1982. Trends for the remaining two birds (one native and one alien) were considered relatively stable. Only five birds, including the Tinian Monarch, showed significant differences among regions of Tinian by year. Increased development on Tinian may result in increases in habitat clearing and expansion of human-dominated habitats, and declines in some bird populations would likely continue or be exacerbated with these actions. Expanded development activities on Tinian would also mean increased cargo movement between Guam and Tinian, elevating the probability of transporting the Brown Tree Snake (Boiga irregularis) to Tinian, which would lead to precipitous decreases and extinctions. recapture data using the program MARK to estimate apparent survival in the endangered Maui parrotbill (Pseudonestor xanthophrys) and Maui ‘alauahio (Paroreomyza montana). Annual survival estimates were high in adult Maui parrotbills (0.84 ± 0.04) and Maui ‘alauahio (0.78 ± 0.15). 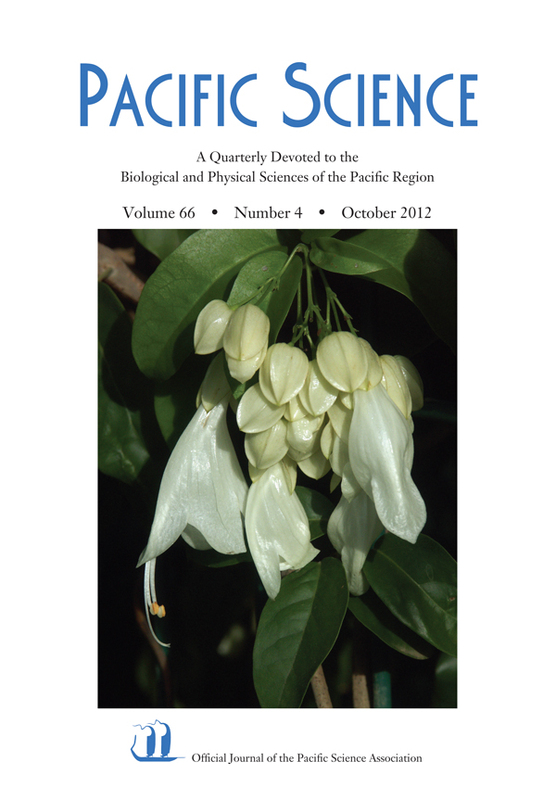 Survival was lower in hatch-year parrotbills (0.76 ± 0.09) and hatch-year ‘alauahio (0.64 ± 0.13), and survival of ‘alauahio also varied among years (0.51 ± 0.18 to 0.95 ± 0.06 in adults). These results provide important baseline data for two little-known species of honeycreepers and, together with ongoing nest success and productivity studies, will enable assessment of population trends and inform management decisions. Mark-recapture methods are a useful tool for monitoring populations of rare and cryptic species that are difficult to monitor using traditional survey methods. Near-surface distribution (10–40 m depth), abundance, and biomass of small pelagic fish were estimated using an echo sounder (EY-60, 120 kHz) during January 2007 in central and northern areas of the Gulf of California. Small pelagic fish distribution was spatially correlated with simultaneous, continuous, high-resolution measurements of 4 m depth temperature, salinity, turbidity, chlorophyll a, and dissolved oxygen concentration to characterize water and habitat conditions. Small pelagic fish shoals were concentrated in five areas of northern and central parts of the gulf, along the coast of Sonora, and south of Isla Tiburón. About 62% of small pelagic fish abundance and 57% of the biomass was echo-detected during the night, when small pelagic fish tend to assemble near the surface. Fish abundance in these areas (11,210 km2) was estimated at 6.16 × 109 individuals. Echo- integrated median biomass was 2.6 × 105 t. Projecting this biomass to the surveyed area (80,102 km2), median biomass of multispecific small pelagic fish shoals could be up to 1.92 × 106 t. Fish shoals were significantly associated with areas at 15.0°C–17.5°C, >2 nephelometric turbity units, and dissolved oxygen concentrations >5 mg O2 liter-1 at depths of 4 m. These areas were not associated with specific chlorophyll a concentration or salinities. Distribution of fish shoals was highly concentrated during winter despite apparently homogeneous environmental conditions. We observed a Giant Trevally (Caranx ignobilis) ramming and mortally injuring a pair of adult Blacktip Reef Sharks (Carcharhinus melanopterus) in the Palau Islands of Micronesia. Such ramming behavior is known to Palauan and Marshallese fishermen for large-sized individuals of several different species of jacks (Carangidae). In addition, we interviewed knowledgeable Palauan subsistence fishermen regarding episodes of ramming that they had witnessed. Our observations suggest that ramming of sharks may be a normal aspect of jack aggressive behavior. These observations expand our knowledge of social behavior between sharks and large jacks. Life history and growth of the surf clam, Mactra veneriformis, were examined in a tidal flat area of Tokyo Bay from November 2002 to November 2004. Gonads of both sexes began to develop in March, and animals with mature gonads (ripe phase) were observed from spring to summer (April–August). Most of the animals showed signs of having finally spawned by September, indicating that spawning occurs from spring to summer. Moreover new cohorts were established several times in both years, with the largest settlement occurring in July. These findings suggest that surf clams in this area spawn several times a year. By monitoring increase in shell length of these cohorts, we found that shell growth was rapid in the first year, reaching approximately 35–40 mm 1 yr after settlement. In the second year, shell lengths exceeded 40 mm. Most of the animals died after the spawning season in the second year. The observation of several settlement events per year and a short life span differed considerably from characteristics of M. veneriformis along the Korean coast. An extensive collecting effort resulted in identification of 106 species of polychaetes from the intertidal and shallow subtidal of Isla del Coco, Costa Rica. One hundred and three of the species reported here are new records. Only two species had not been previously collected from the Pacific coastline between Mexico and Chile. Transport of polychaetes to the island either as larvae, adults, or by rafting is discussed. Comparisons are made with the less well-analyzed polychaete fauna of the Galápagos Islands, with lower species richness on the smaller and ecologically less variable Isla del Coco. Relative lack of isolation between the polychaetes of Isla del Coco and the mainland is discussed. A new species of Veleroa, V. setteana Abbott & Ballantine, has been collected from the Northwestern Hawaiian Islands. Veleroa setteana is among the larger of the Veleroa species, reaching a height of 30 cm. The new species is highly corticated with cortication beginning in young thallus portions. Tetrasporangia, which measure up to 60 μm in diameter, possess three cover cells and are produced in principal indeterminate axes and more commonly in short indeterminate laterals. The genus Veleroa is properly placed in the Brongniartelleae. We assessed diet from a sample of Jackson’s chameleons inhabiting wet forest in Volcano Village, Hawai‘i Island, Hawai‘i. Most lizards contained food in their gastrointestinal tract, diet was broad, and large numbers of invertebrates, mostly insects, were consumed. Native insects composed the largest component of dietary items, and these spanned most of the body-size range found in the native invertebrate community. Taxonomic composition of diets does not conform to expectations for iguanian lizards inasmuch as hymenopterans form only a small portion of consumed items. Insect chemical or stinging defenses did not preclude consumption by lizards. The study site is a mixture of native and alien vegetation. Chameleons collected from alien plants contained larger numbers of native prey items than did those lizards removed from native plants, suggesting that lizard residency on non-native plants will not reduce their predation impact on native invertebrates in mixed forest. Our results confirm the finding of a similar study in dry-forest habitat on Maui that Jackson’s chameleons are likely to pose a substantial threat to a broad range of native invertebrate biodiversity in Hawai‘i. A thorough review of Oxera pulchella Labill., also called the “royal creeper,” was carried out to better understand the amazing story of this almost forgotten New Caledonian ornamental species. The history of this plant is interestingly related to the history of New Caledonia. The literature record’s analysis shows that taxonomic placement of the genus Oxera Labill. has been widely discussed from its discovery until very recently. This review also offers the opportunity to understand and hypothetize how Oxera pulchella was exported and disseminated worldwide through botanical gardens and private nurseries at the end of the nineteenth century. Along with a review of Oxera pulchella’s etymology, vernacular names, iconography, and horticultural fame, this review considers its current taxonomy, horticultural importance, conservation, biology, and various economic issues with a perspective from our ongoing research on this genus of special ornamental potential. The monophyletic Hawaiian violet lineage includes five species that are endangered or threatened. A new population of Viola was recently discovered on Helu Peak, West Maui. Individuals in the Helu Peak population appeared morphologically similar to critically imperiled Viola lanaiensis, endemic to the nearby island of Lāna‘i. To identify the population on Maui, the Internal Transcribed Spacer sequence from the new population was compared with all other known Hawaiian violets using maximum parsimony. Leaf and floral traits were compared between the Helu Peak population, V. lanaiensis, and V. oahuensis. Maximum parsimony analysis placed the Helu Peak population in an unresolved polytomy with V. lanaiensis and V. oahuensis. Canonical Variates Analysis of leaf variables suggests that the Maui population is morphologically indistinguishable from V. lanaiensis. Floral organ lengths of the new population overlap with previously published values for V. lanaiensis. Due to similarities in morphology and close genetic relationships, we are classifying the Maui population as a new interisland population of V. lanaiensis. On Lāna‘i, V. lanaiensis is reduced to an extant population of six individuals. Over 140 individuals are currently distributed on Maui. Despite the increase in the wild population of V. lanaiensis, the species will likely remain listed as endangered. Conservation actions for the species on Lāna‘i and Maui will involve seed collection and storage, propagation and outplanting, and habitat protection. We used aerial photography from 1954 and airborne LiDAR and imaging spectroscopy from 2008 to infer changes in extent and location of tallstature woody vegetation in 127 km2 of subalpine dry forest on the island of Hawai‘i (Pōhakuloa Training Area), and to identify 25.8 km2 of intact woody vegetation for restoration and management. Total cover of woody vegetation was 54.7 km2 in 1954 and 58.6 km2 in 2008. Approximately 28.9 km2 underwent woody vegetation change (22.7%) between 1954 and 2008. Increases in woody vegetation cover occurred in 16.4 km2, and 12.5 km2 represented reduction of woody vegetation cover (12.9% and 9.8% of the 127 km2 study area, respectively). Our findings suggest that 3.9 km2 (3.0%) experienced a net increase in woody vegetation cover between 1954 and 2008. Spatial patterns suggest that fires may be the primary driver of reductions in woody vegetation cover. Increases could be due to regeneration of dry forest trees or measurement errors associated with historical imagery. Areas remaining in woody vegetation cover over the 53-yr study interval can be targeted for restoration and management. We discuss challenges to integrating historical photography with contemporary conservation and management in Hawai‘i and the Pacific and we outline additional studies that would help to improve estimates. The methods and analysis are general and could be applied to other dryland ecosystems with complex volcanic substrates in Hawai‘i and the Pacific. Conservationists previously described the need for research into using translocation to rescue threatened populations. We conducted an experimental translocation of Tuamotu kingfishers (Todiramphus gambieri gertrudae) to provide foundational information about movement ecology and inform conservation planning for the critically endangered bird. We captured and radio-marked mated pairs of kingfishers on Niau Atoll, French Polynesia, where approximately 125 individuals compose the last remaining population of Tuamotu kingfishers. One bird from each pair was translocated to a reintroduction site on the opposite side of the island, and the other pair member was released back onto the home territory. Home-ranging pair members remained on territories and used habitats disproportional to availability, as determined by Brownian bridge analysis. Translocated individuals made multiple forays from the release site to explore the surrounding landscape, during which habitats were used in proportions similar to availability. The exploratory behavior resembled that of dispersing juvenile birds, which suggested that adults retain the ability to explore, and that dispersal theory may be a useful basis for planning translocations. Vacancies on donor territories were filled within 1–10 days. Our results indicated that translocation was not effective for range expansion on Niau because birds readily returned to donor areas; however, translocation to other islands remains a potential conservation strategy for Tuamotu kingfishers. This study compares percentage cover of benthic organisms at the species level at Pearl and Hermes Atoll (PHA), the largest atoll in the Northwestern Hawaiian Islands, to determine (1) the degree of difference among sites, (2) whether wave-exposure zones explain observed patterns in benthic community structure, and (3) whether species richness differs among wave-exposure zones. Thirty-four sites were surveyed representing four categorical-wave-exposure regimes: high, intermediate-high, intermediate-low, and low. A two-way nested analysis of similarity (ANOSIM) found significant differences among sites and that wave exposure explained some, but not all, of this variation. High and low wave-exposure zones were found to differ significantly from other zones. Low wave-exposure sites exhibited the highest similarity to each other and were dominated by the finger coral Porites compressa (38% cover). High wave-exposure sites were also similar to each other and were dominated by crustose coralline red algae (37% cover). Sites within the intermediate-high zone exhibited substantial variability; however, the presence of the green alga Microdictyon setchellianum was a unifying characteristic among many sites in this zone. Finally, intermediate-low wave-exposure sites exhibited the greatest degree of variability among sites and also exhibited the greatest level of benthic species diversity, including presence of rarer species. Wave exposure proved a useful tool in describing the diverse assemblages of benthic communities at PHA, especially for sites experiencing extreme high and low wave exposure. A new anguillid eel species, Anguilla luzonensis, was recently discovered on Luzon Island of the northern Philippines, but little is known about its life history. DNA identification was used to determine that five leptocephali of this species (29.2–51.2 mm) were collected offshore in the western North Pacific (13°–17.5° N, 125°–141° E) in April, June, and July between 2002 and 2009. One leptocephalus was caught west of Luzon and four were close to the spawning areas of Anguilla japonica and Anguilla marmorata. Otolith microstructure showed that the leptocephali were up to 103–138 days old. Glass eels from northern Luzon in previous studies that were thought to be Anguilla celebesensis now appear likely to have been A. luzonensis, and they were estimated by otolith analysis to have long larval durations similar to those of A. marmorata. Estimated hatching dates of these glass eels and the A. luzonensis leptocephali were both in the February to May season. Offshore presence of leptocephali of A. luzonensis and direction of ocean currents suggest that this species migrates offshore to spawn in the North Equatorial Current. The lancelet Asymmetron lucayanum complex was collected from subtidal (5–42 m) sandy bottom during a benthic survey designed to describe the biota of Cocos Island National Park (Parque Nacional Isla del Coco), Costa Rica, a World Heritage Site. Taxonomically significant characters of A. lucayanum (number of myotomes, gonads only on the right side of the body, shape of metapleural folds) are discussed. These lancelets were living in poorly sorted and slightly gravelly sand. Although this taxon has a circumtropical distribution, this is the first time it has been collected anywhere in the eastern Pacific. The marine red alga Schimmelmannia cf. elegans was identified from samples collected from an aquaculture facility on the island of Hawai‘i based on morphological and molecular data analyses. The genus has never before been reported from the Hawaiian Islands. Awareness of this species is raised given that it has been suspected as introduced in Cape Town, South Africa, and because Hawaiian coastal marine waters are already heavily impacted by introduced algae.